Thanks for your help. When using the turbo, the cross must twinkling before being permanent. I guess it's the same problem with shiva's eyes. I'm sorry, it's not simple to explain. If I well understand, by editing this png and delete this section, the original animation will be restored ? I'm not sure because there is a lot of icon***.png in different colors. If I delete on the master one, will it be enough ? Hey bayer! This might be due to the version of the mod you're using - are you using a different language other than English? What you could try, is instead of deleting /textures/ic/iconflmaster/iconflmaster_15.png, just make it 50% transparent and see if that fixes the problem! This might be preferable to just deleting it, anyway! If this doesn't work, you can remove it completely -- This will also remove a lot of the upscaled text, but it will fix your issue. Right now, I would need to test a battle with your debug from your language version to see if I could actually 'fix' the issue with your language version of SeeD Reborn. This is not a problem in the english version because iconfl03_15.png and iconflmaster_15.png handle the hi res/transparent text respectively, but since the 'foreign' versions don't use the hi-res textures, your version doesn't use a different texture page for transparent/non-transparent textures. Thanks for your answer ! I’m playing with the french version ! I will see on my side to delete the master png and erase only the appropriate icons to see if there are some improvments ! Don't just delete the icons - make the page 50% transparent. if that doesn't work, then you have to delete the whole page and not just the icons or the icons will be blank. A faithfull hi-res PSX font restoration was already made here here. Hi-res PSX buttons should be easy too. There's a mayor issue (in my opinion) about recreating a very accurate user interface: unlike FF7, there's only 1 type of texture for field and non-field. 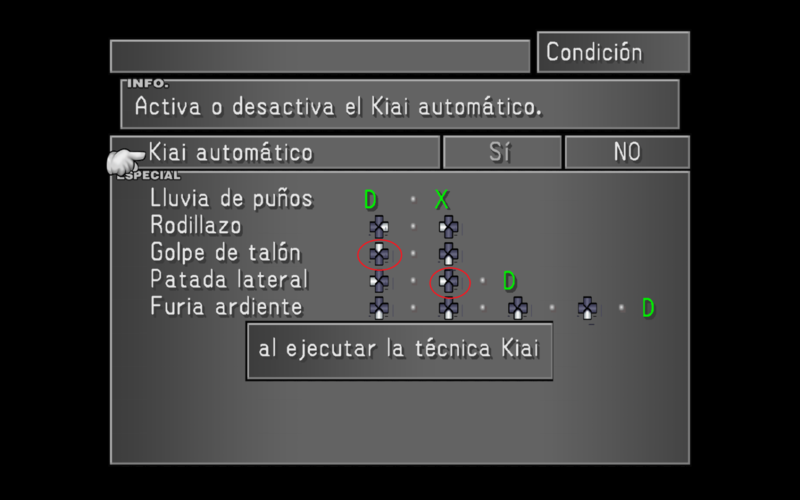 For example the game displays 1:1 text texture in dialogues on field, on the other hand, the text in menus is horizontally shrinked and same thing occurs with the rest of the textures which causes some artifacts. So even if you do manage to get perfect hi-res textures the menu UI will never look sharp and crisp. What language version do you use? The English version works just fine with healing/damage numbers. If you're having issues seeing them, could you please pm me and we can go through a process to make that texture available to you and everyone else using your language pack! It depends on what text you use and what anti-aliasing settings you use when using GeDo. My SeeD 3.2 and 3.5 text seems to work pretty dang well with Gedo, but this happens on many gedo apps, which is why there's normally a way to disable post processing effects on the UI - but there's no way to get the depth information in order to enable that feature. Honestly, I just use Gedo for supersampling, and use reshade for anti-aliasing. it works much better. Hi, I was talking about the PSX look-alike font that was linked a few posts earlier. The font that comes with seed works perfectly without artifacting, but when you swap it in for that psx hd font, then there are some slight artifacts in the menus. I am using the english version of the game and I guess that psx font doesn't replace the damage numbers because it only contains the two sy folders whereas the battle numbers are somewhere in the IC folder. Oh! I see! I understand now. Yeah - any stray semi-transparent pixels will 'pop-out' of the background when you anti-alias, when they don't when you aren't using it. If you like that font, you can take some notes on where those artifacts appear (they will always be in the same place) and the creator of that mod can fix those if you bring it to their attention. Also, if you download SeeD Reborn you can just install those PSX style sy folders instead of the ones that come with it. Several palettes could not move from iconfl 0-1-2-3 because I do not know which numbers these colors have. If anyone is interested, you can finalize. I hope Mcindus and the others, you can write a document how to correctly redraw the texture, I manually redraw the 2.x version when often began to update, I just abandoned ..
Hi, this would allow to use the mod with the non steam pc version of the game? Yes, to use this mod, with the PC version of 2000. For the look you're trying to get, I would use SeeD Reborn 3.2 (which was made in an attempt to match the original as closely as possible) and use the PSX fonts on top of that. You'll get better healing numbers, but they'll not be the 'newest' ones and will be closer to the Vanilla look. "1. Install SeeD Reborn from the main post! (Italian users skip to step 2)"
will you have a french version 3.5? Yes! French, German, and Spanish! There will also be some new title screen and 'skin' options! I can only do so much (there's only one of me) but I'm working very hard! I want to start by thanking you so much for your hard work. 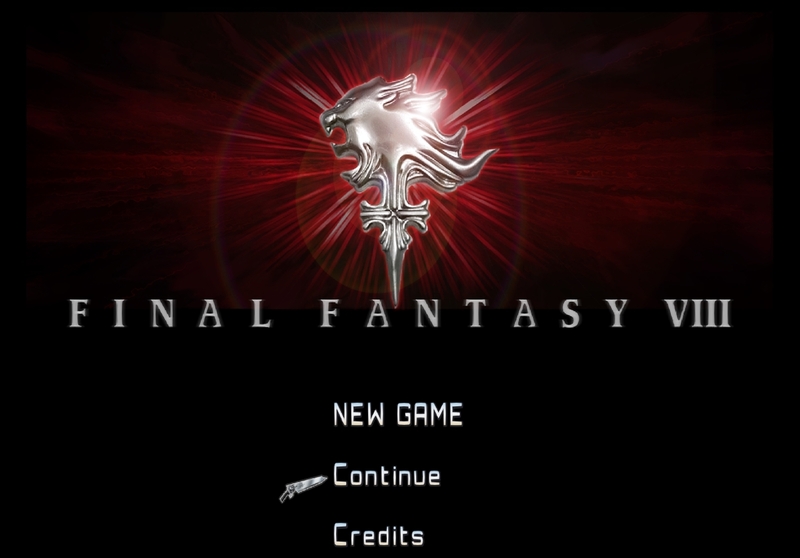 Playing FF8 with orchestral version was my 1st priority, and earring it when I installed music mods was increadable ! By the way, I tried to dl SeeD Reborn french menu version but none goes to a file DL, the link seems not to work. Do you know why ? When it will be fixed ? So my new FF8 experience will be perfectly completed !! I cant make the ic folder to work on the mod, everything in this folder wont show up in-game. "gf", "fa", "st", "sy" and "ma" works fine. I placed all these folders inside "ff8/texture" and the "SeeDReborn_hm.csv" inside "ff8/tonberry/hashmap". Steam Overlay are disabled. "Hmm...taken some damage so lets cast vita, lets navigate to spells, next page, there it is. Wait who would be casting? Can't see because the window is covering it. Close the window, ah it's Selphie, navigate to the spell again. So who is low? Damn, can't see the selection pointer and can't see the names in front of the hp bars because of the window. What do I do? Well there is the list of names in window thats covering stuff up, so let's use that. But who was the critically low one? I think something amazing just happened but I couldn't see because half my screen is covered in UI. Ah, let's just heal squall...dang it, he was full up..."
I admit that I am a bumbling noob in comparison to the many ff8 veterans around, but I'd love it if this aspect could be improved somehow. Also about the font I have switched back to the 3.2 one, as the new font just seems very good for Titles to me. It wants attention. Problem for me with using it for all the text was I didn't know where to look. Everything wanted attention, so it was exhausting to read. I agree with Merglasch. Tbh, I thought it worked that way also on vanilla game, but after his post, and after some gameplay footage I watched, I realized my modded FF8 has huge text boxes. Way too much. Both in battles and dialogues. Probably, is an inevitable cons for have interface retexture. Here are some screenshots of a nearly completed SeeDReborn 4.0! 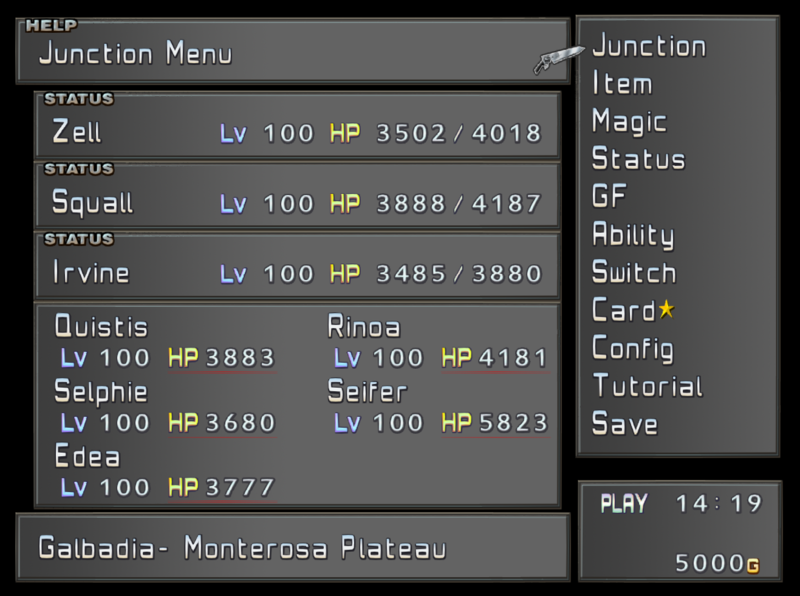 New icons, new font, better colors - a modern Final Fantasy interface for FF8! It's gorgeous. 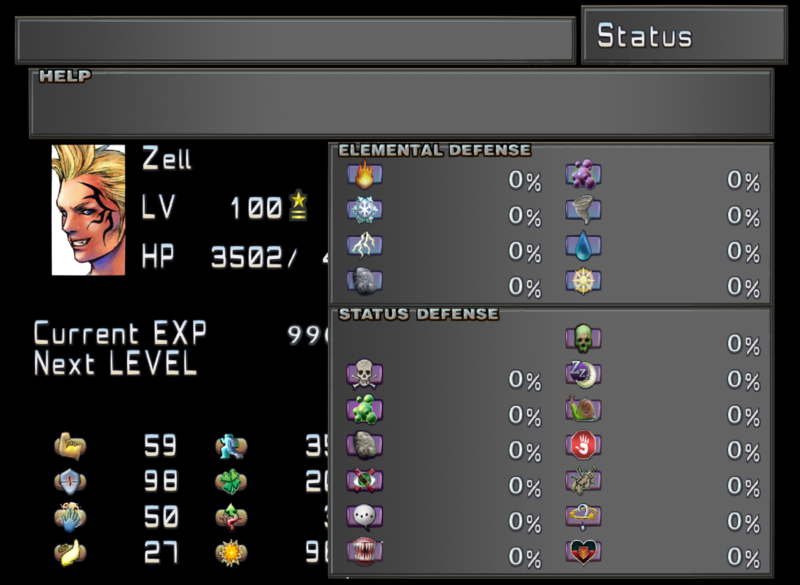 And I love new icons for status defense and elemental defense! IMHO, maybe could be a good idea to also add 2-3 letters text below icons for junction and status. 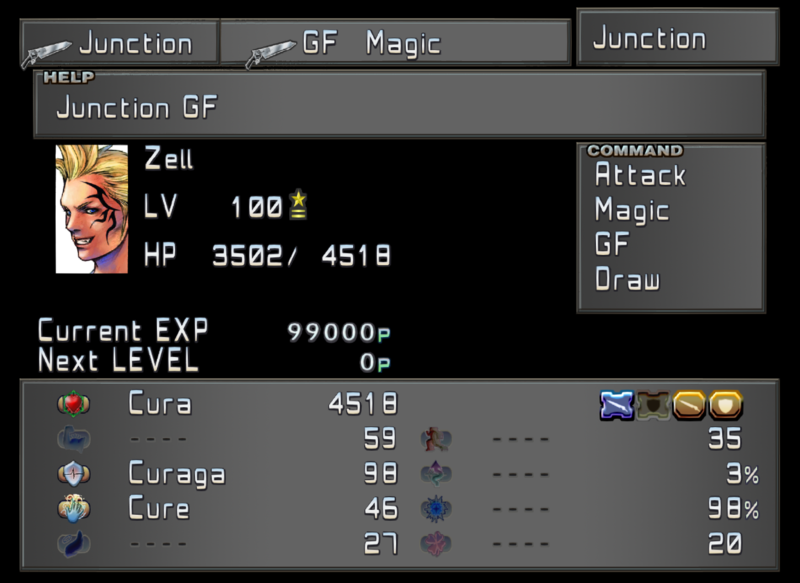 It's not immediately clear what an icon is for, if you are not a FF8 "pro"
For example, you could add a tiny "str" below the arm icon in Status screen, and "hp" below that heart icon in Junction screen. Or maybe not below, but above or inside the icon. For example, the "HP" text could be inside the heart icon, instead of below.